I will begin training for my half-marathon at the end of February. I will be following the training plan outlined here and will be charting my progress on this log. While running, you begin to deplete glycogen storage. The longer the run, the more depleted your glycogen storage becomes and it will eventually run out if not replenished. When glycogen runs out, your body begins to burn fat. This transition stage is commonly referred to as "the wall". Eating before, during (especially runs of 10+ miles), and after a run will help you maintain adequate glycogen. By increasing carbohydrate consumption in daily meals, you increase your glycogen storage and add fuel to your tank. 65% of your calories should come from carbohydrates, particularly complex carbohydrates. 10% should come from protein (you need 0.5 to .07 grams per pound of your body weight each day). 20-25% of your total calories should come from unsaturated fats. During training, you need to add 100 calories per mile to your diet. While running, you should consume 6-8 oz. of water every 20 minutes. Always drink during the two hours leading up to a run and the two hours following the run. These are your most critical times for fluid consumption. 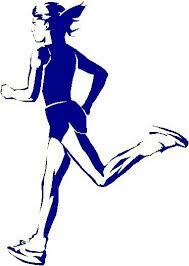 The proper distance running form is for the heels to make contact with the ground first or to run flat-footed. Arms should be relaxed by your side at a 90-degree angle. Run low to the ground. Use energy to propel yourself forward, not vertical. Focus on an object ahead of you while you run. Posture is critical. You should be running with your back straight and your chest slightly leading the way. Do not neglect the importance of stretching! Stretch before AND after every run.